This blog is mostly about sailing our traditional Swedish workboat on upper Barnegat Bay. My wife Julia and I live in New Jersey and keep Sjogin at David Beaton and Sons in West Mantoloking in New Jersey. See the Sjogin Page for more details and a plea for help in determining her provenance. Over time I’ve added more posts about our home and gardens and travels. No politics so far but one never knows. My wife Julia and I feel grateful for where we are and for some strange reason don’t mind sharing in a limited way. 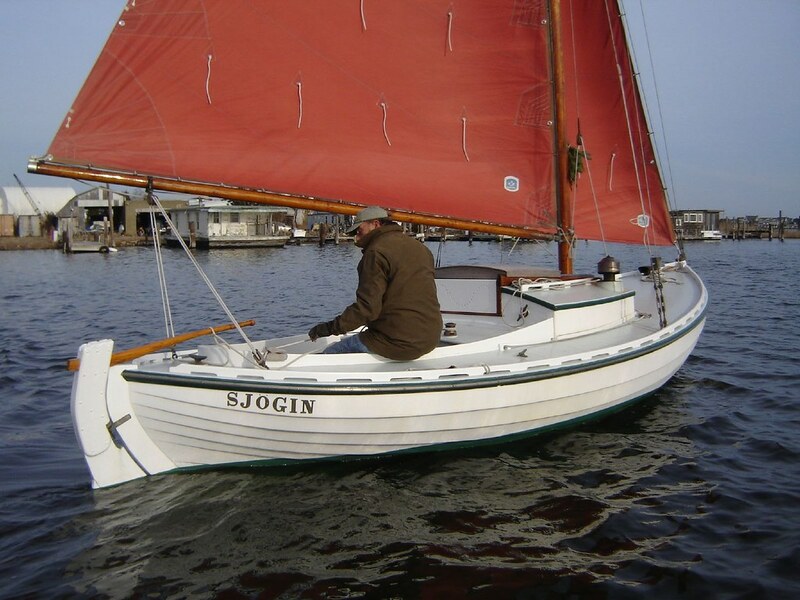 We’ve met a few people through the site and the WoodenBoat Forum and have found all delightful to date. Thanks for stopping by, drop me a line if so inclined. Or you can leave a comment by way of a simple registration with WordPress. Please send any comments, questions, etc., to Ourhouse at Sjogin dot com or use the Contact Me link. * Note that all of the pictures are available for viewing at my Flickr site. Just checked out your blog, after seeing several of your posts on the WoodenBoat forum, and the one today linking to the blog…..very nice! Sjogin is a real beauty! Have long admired boats of this origin, and a Folkboat has also always been on my short list of “dream boats to own someday”! You are one fortunate sailor!! I sail several boats, a small glass mini-cruiser is my “day to day” boat, docked on a chain of lakes where I live in NE Ohio….also was fortuntate a few years ago to acquire an Herb Payson built Bolger prototype Folding Schooner, which is a real treat……..also have a small Mirror Dinghy, a mahogany launch built in Florida (probably from the 40’s) which I can not find anything out about, a rowing dory, several beautiful old Maine canoes (1913 and 1923, Morris and Old Town), a strange round “Circraft” UK built saucer boat, and others…….. Thought I would say hello, as I seem to be often coming over to northern NJ these days; my girlfriend lives in NJ, so I am making pretty regular commutes over to the Garden State…..never thought I would become so familiar with I-80 and all the traffic in NJ!! If you would be open to a visit sometime, it might be fun to stop by your area and say hello…….I think where you are in about an hour south of where she lives in East Brunswick. Her parents have a restaurant in Ocean City, so we go down there also on occassion………. Hope you have a great (sailing) weekend! LOve your blogs, and what a great boat! Sjogin caught my attention when I saw her photo on the “Keep Turning Left” site, Dylan pointed me to your blog site. The reason Sjogin was of interest to me is that she appeared very similiar to the surplus RCN Whaler I am converting to a similiar boat as yours. I do have a couple of questions, as your drawings have scrabbled the text. What is the sail area, and how much ballast is she carrying? One of the oldest guys on our lake in Wisconsin died and his son sold me a Norsk “Nutshell” that looks like it has been rarely used since purchased in 1962. It comes with all the original docs and sales literature from the importer. Sailed it last weekend and its all there and functioning. I would like to sell this to someone who once owned one, someone that would really appreciate it. I saw an article by Jer Welch, maybe he knows someone. Thanks for stopping by and the sharing the story about the Nutshell. I got your pics and will do a post to see if any prior owners want to renew their acquaintance with this fine little boat. Finding you is a goldmine. I’m trapped in my tiny cabin, the snow is flying, cheers! Thanks Stormy. While not trapped, I like the tiny cabin idea. Just enough room for yourself and your dreams.